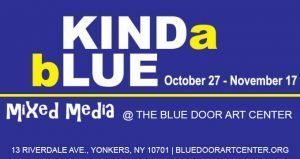 Celebrating the 10 year anniversary of the opening of our Blue Door gallery on Riverdale Avenue, we present Kinda Blue. All shades of indigo, expressions of the blues, and even the moody blues found here. Paintings, collage, ceramics, and more on show True blue artwork from local Westchester artists. Bring home a treasure for your collection or start and new one. This entry was posted in Press Releases and tagged art, art exhi, Art exhibit, art opening, art reception. Bookmark the permalink.